I’ve written previously about what I think are the three best 529 plans, so I listened with great interest when Brian Preston covered college savings during a recent episode of the Money Guy podcast. During this episode, Brian talked about his favorite 529 plans and also listed seven of the worst plans according to Morningstar. Click through to my original “Best 529 Plans” post to get details as to why I like these plans. In short, they all feature Vanguard funds and have dirt-cheap fees. First, you’ll notice that the only overlap between our lists is Utah. While there’s nothing particularly bad about the balance of his favorites, their fees aren’t quite as low as in the plans that I picked. Like Utah, New York is a Vanguard plan. In contrast, Alaska and Georgia are T. Rowe Price plans, whereas California features Fidelity funds. I should also note that he’s partial to Georgia because that’s where he lives, and he gets a state tax break. Finally, a word to the wise… Many states have multiple plans, so be sure you’re getting the one that you want. I have a national Vanguard 529 plan through uPromise. Does anyone have any thoughts on this plan? I do plan on opening up NJBest and send my $300 a year to qualify for the $1500 scholarship. For my main plan I’m torn between Ohio & Iowa. Iowa comes in a little higher on the expenses at .52. I also like the fact that Iowa keeps the age based “aggresive track” at 100 stocks during the 6-10 year old range. Ohio,after 100% stocks from 0-5 adds in some bonds(35%?) during the 6-10 year stage. Morningstar seems to like the age based diversification of the Iowa fund as well. Wow, it’s a real eye-opener to see my state’s 529 plan on the list of worst plans out there. 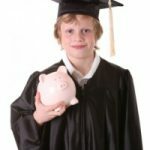 I’m glad I saw this post, since I was seriously considering my son’s college savings. Thanks very much for the tip. I’d like to hear his reasoning to pick some of the ones he did over Ohio. I was partial to California (even though there’s no tax break) just because I live there. Yet it still didn’t match up. I wish our plan here would offer a tax break on contributions; that would make it so much more appealing for us. I appreciate fivecentnickel.com linking to my October 8, 2007 Money Guy podcast. If anyone is a Georgia resident as of December 11th the plan has improved significantly. The income limitation for the annual tax deduction has been removed (6% matching for GA residents with tax deduction) and TIAA Cref has lowered the annual operating expenses. You have to love what competition does for us penny pinchers. Thanks again fivecentnickel.com for listing my site and information. We participate in the Georgia plan, but I’m not sure why. We never qualify for the tax deduction and I am not entirely convinced they offer the best investments. TIAA-Cref has very low fees, but there investment opportunities aren’t exactly growing leaps and bounds these days, either. RJ – I’m in NJ also. The plan isn’t that great, and there is no tax deduction. But if you contribute $300 per year for 12 years, the student qualifies for a $1,500 scholarship for any school in NJ. Any other money can be contributed into a lower cost, out-of-state plan. Worst case, the kid goes out-of-state and you paid a slightly higher fee (the S&P 500 Index portfolio is 0.58%) on a small portion of your college savings. BINGO! This is what I’ve been looking for too to set up for my kids… It’ll be coming shortly, so I’m sure I’ll find my way back here when I get to it. End of year is really sticking it to me for now though – but soon after! Thanks FCN! Nickel- I was glad to find your first article re: the 529’s as I’ve been looking at them for my 2 year old son. Coincidentally, Icame back to your site and found today’s article. I’m in NJ and it seems like a better option to look out of state. I was looking to stick with Vanguard funds for a 529 and Ohio seems like the best choice for me. I plan on starting with a small initial deposit and contribute monthly.The low fees for Ohio seem to outweigh the out of state fees Utah applies($5 for every $1000). Also, Morningstar seems to give it a decent review for low-cost indexing for out of staters and a decent mix of funds. Morningstar doesn’t seem too high on New York because there is no international fund if I recall. Anyway,that’s just my two cents.Did you end up going with Ohio? I live in Illinois, and am about ready to set-up a BrightStart (That’s Illinois’ 529) plan for our 4-month old. I’m thinking I’m going to pick the passively-managed (or index allocation strategy) Equity Portfolio. It has an expense ratio of 0.20, and I think also a $10 annual management fee. Utah is definitely the top of the line. So if your state falls into the worst category take a look at Utah. I am also a fan of Iowa and New York’s plans. Those three top out my list. I also think if there are tax advantages in your state you need to take advantage of those plans. The tax advantages will allow you to overcome a little higher management fees. I would also recommend looking at the West Virginia plan. I have just recently looked at that plan. They utilize DFA funds. For those who haven’t heard of DFA, these funds are passive, like Vanguard index funds, but the funds are based on the work of academic heavyweights like Rex Sinqfield, Euguene Fama, and Ken French. Many state plans come in two flavors (direct sold and advisor/broker sold). The cost structures and fees between the two plan versions will be different, and sometimes, so will the investment options. The advisor/broker sold versions need to include loads, wrap fees, and/or 12b1 fees in order to compensate the broker for the sale. Naturally, that comes out of the consumer’s pocket. Because the investments and trading activity is limited within section 529 plans, there is no additional value in paying more for the broker sold options. Also, most brokerages only have sales agreements with one or two states and most states only have sales agreements with one or two brokerages, so it’s likely that the only advice you’ll get from a advisor is to invest in the state’s plan sold through his or her brokerage.